A laser is effectively a machine that makes billions of atoms pump out trillions of photons (light particles) all at once so they line up to form a really concentrated light beam. 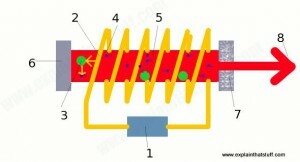 A red laser contains a long crystal made of ruby (shown here as a red bar) with a flash tube (yellow zig-zag lines) wrapped around it. The flash tube looks a bit like a fluorescent strip light, only it’s coiled around the ruby crystal and it flashes every so often like a camera’s flash gun. How do the flash tube and the crystal make laser light? A high-voltage electric supply makes the tube flash on and off. Every time the tube flashes, it “pumps” energy into the ruby crystal. The flashes it makes inject energy into the crystal in the form of photons. Atoms in the ruby crystal (large green blobs) soak up this energy in a process called absorption. When an atom absorbs a photon of energy, one of its electrons jumps from a low energy level to a higher one. This puts the atom into an excited state, but makes it unstable. Because the excited atom is unstable, the electron can stay in the higher energy level only for a few milliseconds. It falls back to its original level, giving off the energy it absorbed as a new photon of light radiation (small blue blob). This process is called spontaneous emission. The photons that atoms give off zoom up and down inside the ruby crystal, traveling at the speed of light. A mirror at one end of the laser tube keeps the photons bouncing back and forth inside the crystal. A partial mirror at the other end of the tube bounces some photons back into the crystal but lets some escape. The escaping photons form a very concentrated beam of powerful laser light. Just how did all this start? “Light amplification by stimulated emission of radiation” or “laser” was first known as the maser: microwave amplification by stimulation emission of radiation and, Charles Hard Townes is credited with conceiving the idea while sitting on a park bench on April 26, 1951.
microwaves, music, telephones … and, let’s not forget to mention the bar code scanner which, without those, there’s no telling just how long we might have to wait in a Walmart line. In 1905, Einstein released his paper on the photoelectric effect. In 1918, Planck received the Nobel Prize in physics. Meanwhile (and back at Bell labs) “Townes had hired Schawlow for a postdoctoral project involving the application of microwave spectroscopy to organic chemistry. Schawlow didn’t care much for organic chemistry, but he knew something about microwaves from his wartime work on radar. He measured nuclear quadruple moments and, with Townes, studied the effect of nuclear charge distribution on X-ray fine structure. It was through their collaboration on a book, Microwave Spectroscopy, that Schawlow met Aurelia, Townes’ sister. The two married less than a year later. 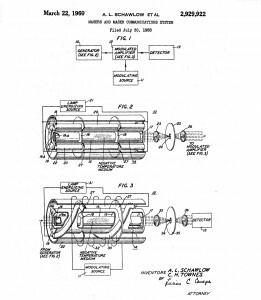 Schawlow and Townes first filed for their patent on July 30, 1958, but the rest of the story becomes a little less like a Star Wars trilogy and more of a candy store caper when Columbia grad student, Gordon Gould jotted his idea for building a laser and had it notarized at a candy store in the Bronx on November 13, 1957. 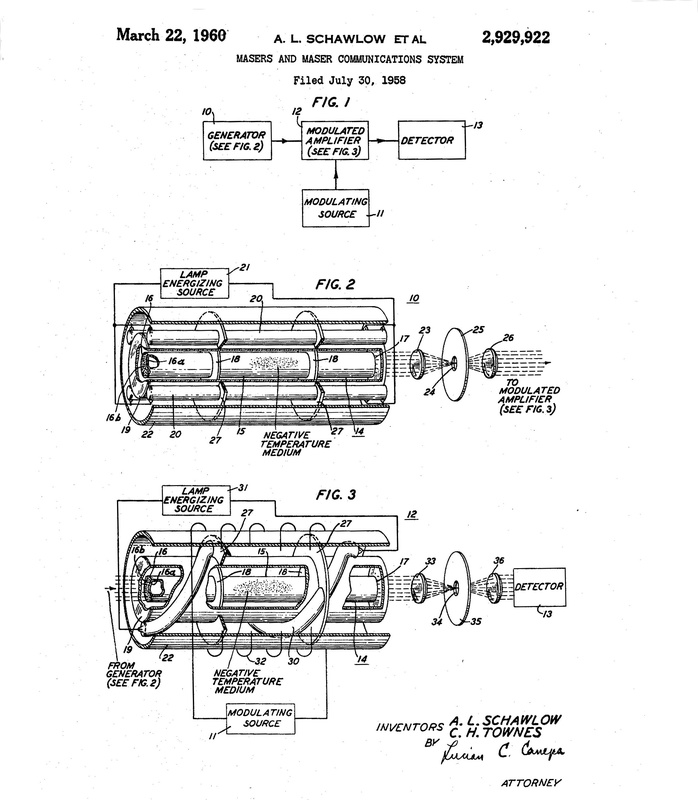 Schawlow and Townes were granted the patent which led to a 30 year patent dispute over the invention of the laser. And Gould wasn’t the only one: by 1961, Lasers begin appearing on the commercial market through companies such as Trion Instruments Inc., Perkin-Elmer and Spectra-Physics. Interestingly, the world’s first experiment firing a laser beam into a tropical storm occurred on September 11, 1994 – nytimes.com – twenty years after the debut of Star Wars and the lightsaber duel.